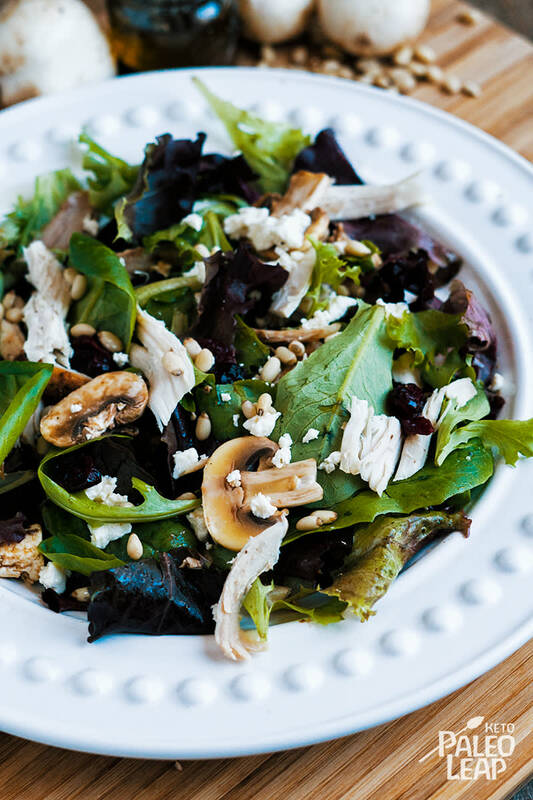 Turkey and mushroom salad invokes the spirit of the holidays, with the visual appeal of dried cranberries, mixed greens and pine nuts, yet it serves a greater purpose year-round: to nourish and heal your body. One could say that it lifts your spirits too, as it is a simple meal that can be prepared in less than 20 minutes, provided that you are using leftover (or precooked) turkey, so you can eat well and hop along your merry way. You can make it dairy-free by omitting the feta cheese, though if you are constantly on the search for a dairy-free cheese substitute, you may want to look into making your own almond feta. Sometimes it is the flavor we are after, other times the texture – either way, it pays to listen to what your body craves and to give into that desire on random occasion. Pine nuts may be that one ingredient that you don’t regularly keep on hand, but maybe you should keep a cup or two in your own private store, keeping in mind that they make an excellent basil pesto. Tastiness aside, pine nuts boost your energy, as well as reducing the risk of heart disease, they may even help your vision. Toast the pine nuts, or eat them raw on your turkey and mushroom salad, and above all, shoot for diversity in your mixed greens. Use some arugula, turnip greens, mustard greens, dandelion leaf and watercress to dress up your salad with greens fresh from the garden, or market. In a bowl combine all the ingredients for the balsamic vinaigrette; season to taste generously, and whisk until well emulsified. In a salad bowl add the mixed greens, turkey, mushrooms and cranberries. Pour the vinaigrette over the greens, mix everything until well coated. Serve the salad topped with pine nuts and feta cheese.